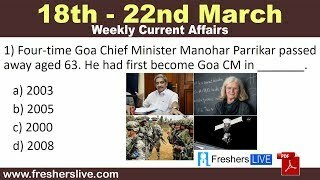 23 March 2019 Current Affairs: The cricket extravaganza Indian Premier League begins on Saturday with its 12th edition. Defending champions Chennai Super Kings will take on Royal Challengers, Bangalore at Chennai in the opening game. According to the CSK director, the entire ticket proceeds of this match will be given to the families of CRPF personnel killed in the February 14 terror attack in Pulwama. Another IPL team, Kings XI Punjab, recently donated five lakh rupees each to families of five CRPF soldiers killed in the Pulwama attack. The cricket extravaganza Indian Premier League begins on Saturday with its 12th edition.